Fifteen years ago, my first book – The Art of Falling Apart – was published by a major UK imprint. It, and my second book, Subpoena Colada, sank without trace. Hardly any sales. No reviews. The only contact I had with readers was when a friend handed me a copy of Subpoena Colada that she had bought in a charity shop, and a note slipped out on which the reader had noted all the legal points that I had got wrong. Not quite what I had in mind. I’d always had the dream that one day I would see a commuter with one of my books open on his or her lap while I took the train into work (this would be just before I quite working to write full time, of course). That didn’t happen, either. The whole thing soured me to the idea of a life as a novelist and I stopped writing for several years. My agent and I parted ways. My editor left and I never heard from my publisher again. The experience just sucked all of the fun out of it for me. It feels funny writing that now, when you’d have to put me in shackles to stop me from writing, but that was exactly how I felt. And then Amazon introduced the Kindle to the market. They made it possible for authors to publish directly, without the need for gatekeepers or middlemen. Three years ago, in early 2012, I published The Black Mile myself. It didn’t do anything much to start with. I didn’t have a clue how to market it. I couldn’t get reviews. I couldn’t get people to buy. How could I get reviews without sales? How could I get sales without reviews? I couldn’t solve that equation for the life of me, but I could see there was potential on the platform and so I kept going. I wrote The Imposter, and then the character that changed everything. I have written seven John Milton novels and two novellas. I wrote three Beatrix Rose novels and three novellas. I have over 20 books available for sale now – on all the major eBook platforms. As I write this now, I have three titles in the Top #20 bestselling books on Amazon.co.uk and In Cold Blood has been as high as #2 overall. My first John Milton box set is ranking just inside the top #200. I have thousands of reviews. I have over 32,000 readers on my mailing list, 9,000 fans on Facebook and 4,000 followers on Twitter. I get emails and positive feedback from readers every single day. I sometimes get negative feedback, too, but that’s OK – I have thick skin, and I can use their criticism to become a better writer. I reply to every single piece of correspondence, good or bad. It’s a highlight of my day. My Beatrix Rose books have been optioned for film or TV adaptations by an amazing Hollywood production company, and I’ve been approached by producers to write spec scripts for them (when before they wouldn’t have answered the phone to me). The BBC has enquired about the rights to other series. 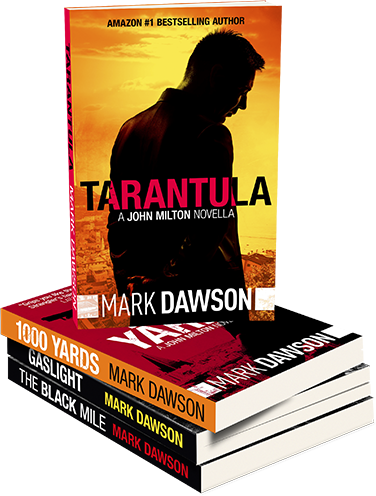 Audible have purchased the audio rights to my Milton books and those have sold brilliantly, too. Amazon is currently featuring me on the front page of the entire store as one of their “gateway” success stories. I had a Forbes article written about me that went semi-viral. I run training for other authors to teach them how to market their books. All of that is amazing, and I regularly have to pinch myself that it has really happened. The other day, I thought I’d take a look at how many copies of my books have been downloaded since I started to self publish in August 2012. I keep monthly stats, but I’ve never looked at the bigger picture. I very nearly fell off my chair. In just a shade over three years, I’ve gone from doing a little jig of joy every time the Kindle dashboard registered a sale to someone other than a family member (no word of a lie) to a really significant – and humbling, and amazing – milestone. At some point this month I had my one millionth download. I still haven’t seen someone with my book on the train, but the odds are very good that someone has been enjoying one. The eReader anonymizes what we are reading, but there are enough of my books out there now that someone must have been reading one of my stories without realising that the author was sitting opposite them. Here’s what I really wanted to say with this post. If you’ve bought one of my books, listened to one of my stories on audio, sent me a message or left me a review, then I am eternally grateful to you. I was able to leave my job last year and write full-time, and that’s meant that I’m able to see my family (I would often miss seeing my kids for days at a time when I was commuting to and from London) and pursue the career that I always dreamed I would someday have. It’s changed my life, and I’ll always be grateful. I’ll continue to write, and hope that you continue to enjoy the stories that are always bubbling up, just waiting to be told. It’s my birthday tomorrow. My wife and I will be celebrating that, and the ways in which our lives have changed. And I’ll raise a glass to you and every one of my readers tomorrow.